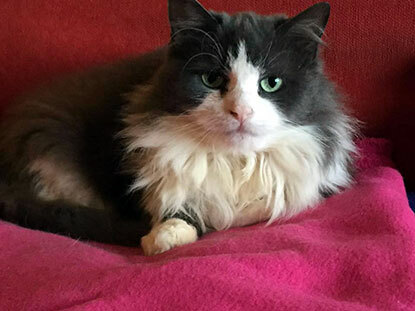 "I love my cat but I am moving house and I can't take her with me. 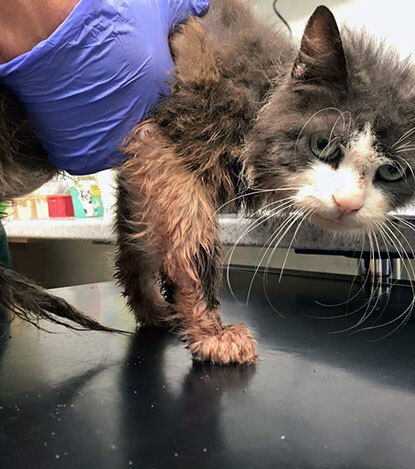 She is healthy but does leave red wet patches wherever she sits…"
This sentence rang alarm bells to me and Deputy Manager, Natasha when nine-year-old Flower was handed over to the Newbury Adoption Centre early one morning by her owner. Our hearts broke when we took Flower out of her carrier. She was soaked, she was filthy red/brown colour, fleas were literally bouncing off her in front of our eyes and she smelled strongly of ammonia (it made our eyes water). We rushed her straight to the vets. 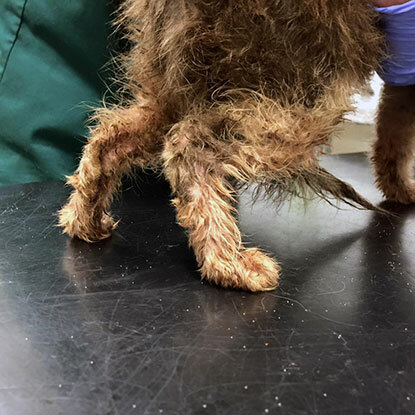 The vet had never seen such a bad flea infestation, her body was covered in a thick crust of flea dirt, fleas and flea eggs were dropping off her and she was dangerously anaemic. It’s devastating to think of the conditions that she must have been kept in to have been covered in so much urine. Cats do not like to be unclean; she couldn't have had access to a clean litter tray. Flower had weeks of veterinary treatment, love and care and finally began to trust us. Her fleas were all gone and after several baths it was discovered she was actually a grey and white cat and not brown and yellow! She even had a lovely fluffy coat. Flower went to her forever home in November. We couldn't have wished for a happier ending and we wish Flower and her new family all the very best. beautiful girl, how could anybody do that to an animal. at least she now got a forever loving home. Very glad she's now got a new home and looking so healthy. Flower is beautiful! So glad she is healthy & happy now! This story made me cry!! Wish her all the best! Oh, my! Flower was fortunate that her owner gave her up. She looks like a new cat entirely! were her previous keepers ever fined of prosecuted for the horrific neglect? Hi Alexi, thanks for your comment - the matter of reporting this to the RSPCA is being looked into.